My Thoughts: I have only read the first book in the Evermore series so I'm not too familiar with Riley or her family yet. 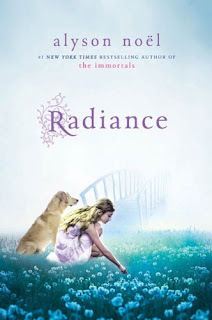 But I went ahead and read Radiance anyways. This novel is about a girl named Riley. She lives in Here now. She does what she usually does. Lives with her parents, goes to school, walks her dog, etc. She is called upon to be a Soul Catcher. Everyone in Here eventually gets placed and gets a job, or task. Riley's is to catch souls. She gets a mentor named Bodhi. She goes on a mission to get the Radiant boy to cross over. It isn't an easy task, as he's been around for ages scaring others away from the task. Does she complete the task? What happens to Riley next? This was a really short and fast read. It didn't take me long to finish at all. I also can't give away too much details or I will have summarized the whole book. Has anyone else read this book, how did you feel about it? Overall: Honestly, I thought I would love this one. It sounded like such a cute book, and a spin-off at that. I was left feeling unsatisfied. It didn't quite live up to my expectations. It was just okay. Maybe it would be better if I read the whole Evermore series first? I guess I might have to try that, before reading Shimmer. Cover: I love the cover. Its stunning. I even like the dog sitting next to her.